Fall is red pepper season; green all summer…done ripening at last! They were on sale last week at the grocery store. They are a decent value right now because red peppers are ripe peppers and produce is always cheaper when plentiful. So I was thinking about making something with them. I wanted to create a special fish dish; as close as I could remember to something I enjoyed many years ago at a Hispanic restaurant in northern New Jersey. Big homey place, no one spoke English on the staff but the food was incredible and we had the best time there. 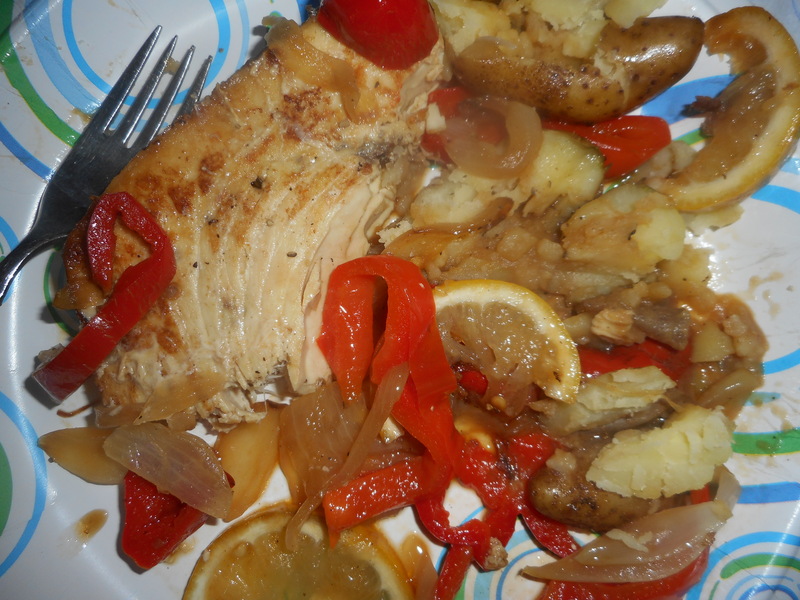 I enjoyed a roasted swordfish with peppers that was so moist, a huge steak and really tasty. Been wanting to replicate it for a long time. Finally I tried and succeeded the first time! I know, swordfish is pricey and some folks think it isn’t as good a health choice as say, wild salmon, but I like to vary my seafood. It isn’t like I eat swordfish that often; maybe once a year. I served this for a Sunday supper for my mom and she really enjoyed this meal. I loved the veggies and the flavor they gave to the fish. Delicate and moist; no dried out fillets for us! The lower oven temperature helps keep it from sizzling up. I allotted 4 ounces for each of us; not that pricey when you don’t serve over-sized portions. Bought it frozen and just defrosted it in cold water (vacuum sealed by the seller) – no marinating or other tricky stuff. The lemon slices and potatoes are my additions to what I remember from that restaurant meal. I used my own homegrown fingerling potatoes: great flavor and they make the dish seem so elegant. Simple and delicious for a memorable dining experience for not that much money. Sprinkle the swordfish steak with sea salt and pepper; about ¼ tsp salt and a good grind of pepper. Heat half of the olive oil in a fire proof pan that can go straight into the oven. 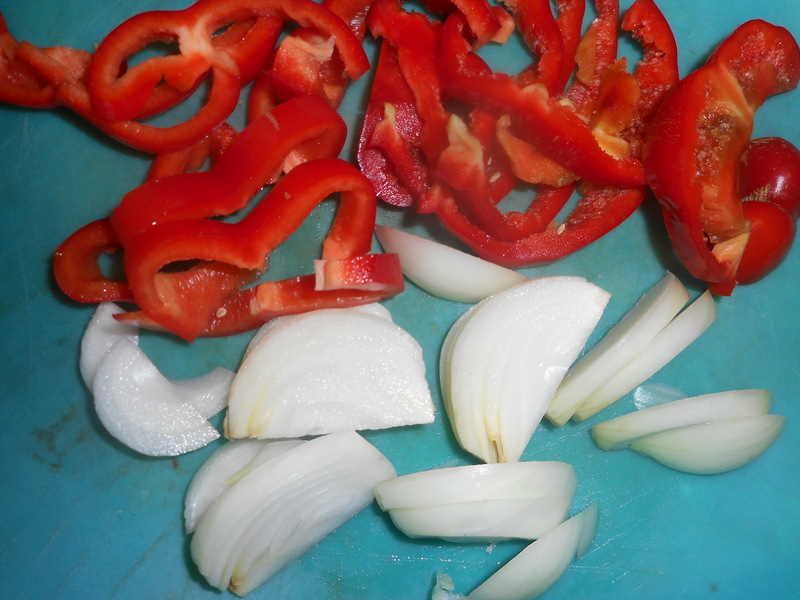 Add the pepper and onion let them cook at a middle flame; stir occasionally. Cook until softened; 5-6 minutes. I like to add half the lemon slices and let them start to cook as well. Remove veggies from the pan to a covered plate, add the other Tbsp. EVOL to the same pan, let it heat until fairly hot but not smoking and add the swordfish, brown for 5 minutes on each side; until getting some decent color. 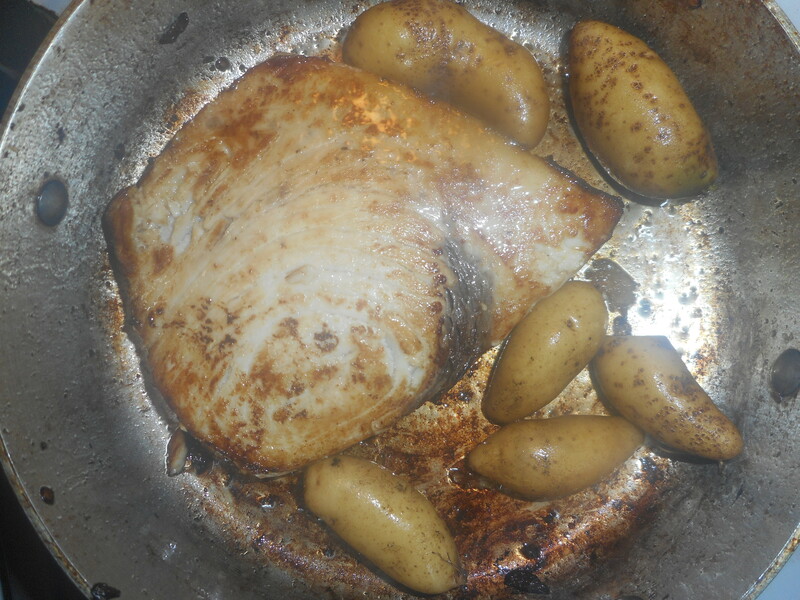 Once the fish has been flipped add the fingerling potatoes to start cooking. If they are small potatoes, leave whole, cut larger ones down the length into two halves so they roast faster. Heat the oven to 350 degrees while the peppers/onions/fish cook. 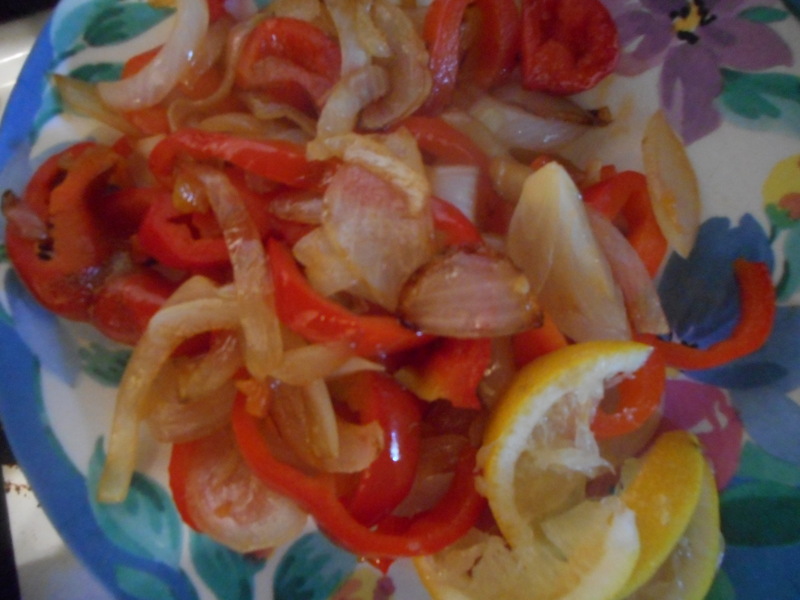 Using a big spoon, heap some of the half cooked red peppers and onions on top of the fish and the rest around it in the pan. Sprinkle the lemon slices over the top of it all. Drizzle the wine over top. Can use broth if you don’t like to cook with wine. Put the lid on tight. Bake for 25 minutes or so until the potatoes are done. Cut the fillet in half and serve on warmed plates. A green salad or some sliced cucumbers/tomatoes make an excellent side dish to this entrée. Enjoy!